B&G Sprayers are the highest quality sprayers on the market today and have been trusted by pest control professionals for over 50 years. You just can't get any better sprayer than a B&G. This particular B&G 1 Gallon hand pump sprayer features a positive tip shut-off (NO DRIP), heavy duty construction - built to last, unique carpet protector bottom ring, spare parts storage inside of ring and the protectors are easily removed for cleaning and provide the utmost in protection. The B&G N124-S-18 1 Gallon Sprayer comes with an 18-inch wand and with a 4 way tip, which includes a fine or coarse fan, and pin stream settings. I have always bought top quality products and the B&G 1 Gallon Sprayer conforms. When using expensive pesticides, it is important to be able to efficiently and safely apply the product. The sprayer has an adjustable head that allows pinpoint accuracy. All the professionals use this product for one reason, dependability. I highly recommend this product to anyone doing their own pest control. Continual usage for 10-12 hours of working a day 6 days a week and only $7 worth of parts needed because of my own abuse (grabbing it from my truck by the hose). This product vs. your 30$ or 60$ sprayers from Home Depot or Ace Hardware can't compare. Quality of spray: Most plastic sprayers I've used have issues with leakage. Either while you walk the arm sway causes leaking, or after you have finished spraying a drop or 2 of drippage which doesn't seem like a lot but when you are spraying a fine mist on an area with wood for example and a drop or two is left it CAN cause damage, but the fine mist dries quick enough that it doesn't. The amount of pressure and how easy it is to generate with these sprayers is amazing in comparison to many counterparts. I know I can get a good 20 or 25 feet with the fine jet stream and have it do it consistently. Last but not least obvious durability - its made of all metal the thing doesn't really bat an eye if you mistakenly drop it, or kick it by accident, bump it into things, etc. Down side to this is if you're not careful it can take other things out. You would think that, when you pay $250 for something, it would come with a Manual which covers BASIC information such as 1. Set Up, 2. Operation, and 3. Use. Wrong! It comes in plain, white box, with a photocopied sheet containing minimal information on 1, 2 & 3 above - mostly troubleshooting, repair, and exploded parts diagrams. Very disappointing. Even DMOPC's videos do not cover this most basic information. The manual included with the sprayer is standard from B&G. You can view this information on our website anytime here: http://www.domyownpestcontrol.com/msds/PrimeLineSprayers.pdf. If you have further questions about how to use your equipment or any other products purchased from DoMyOwnPestControl, we are happy to help via email anytime, or via live chat, or telephone at 866-581-7378 M-F 9a-5p EST. Sus prodictos son exelentes ya que en mi empresa los utilizamos espero poder tener con ustedes una relacion comercial para la compra de sus productos. It is just great! It is a really professional pest control equiptment!. How much does the B&G 1 Gallon sprayer N124-S-18 with 18 inch wand weigh when fully assembled and empty? 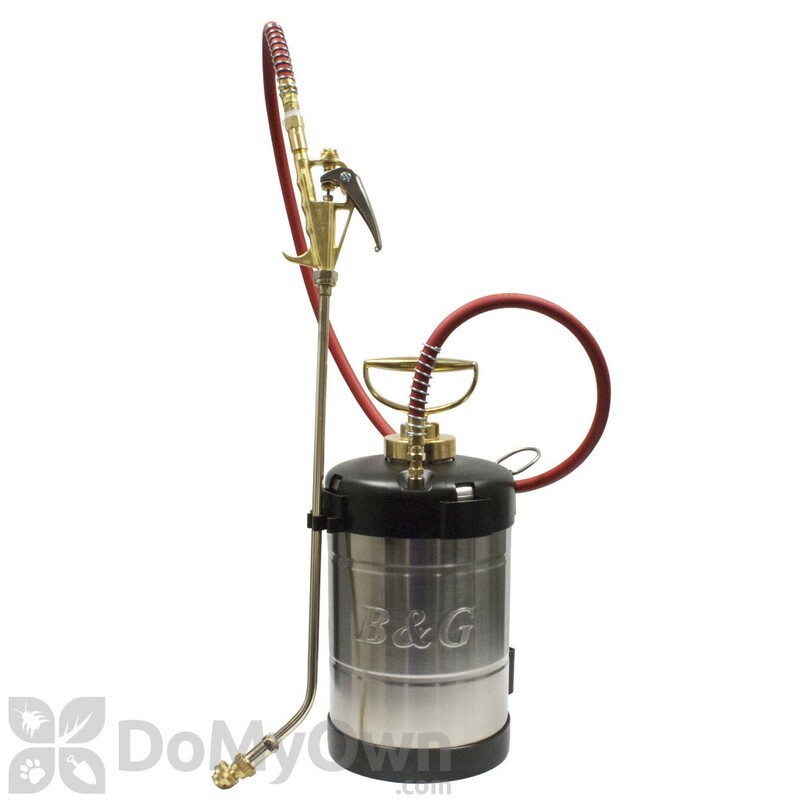 The B&G 1 Gallon Sprayer + 18-inch wand - N124-S-18 weighs a little over 8 lbs. This is fully assembled weight with no liquids inside. What are the recommended number of pumps for a B&G 1-gallon sprayer for adequate pressure? There is no certain amount of pumps in particular for your B&G sprayer. The amount of pressure will depend on where you are treating and how full the sprayer is. If your sprayer is full all the way to the top, that does not leave much room for air and you could probably only physically pump it two times. If your sprayers was half way full you would need to pump it several times…5-8 times to fill the large space with air to force the product out. Really you just need to pump the sprayer until you feel tension on the pump handle and it becomes difficult to pump any longer. 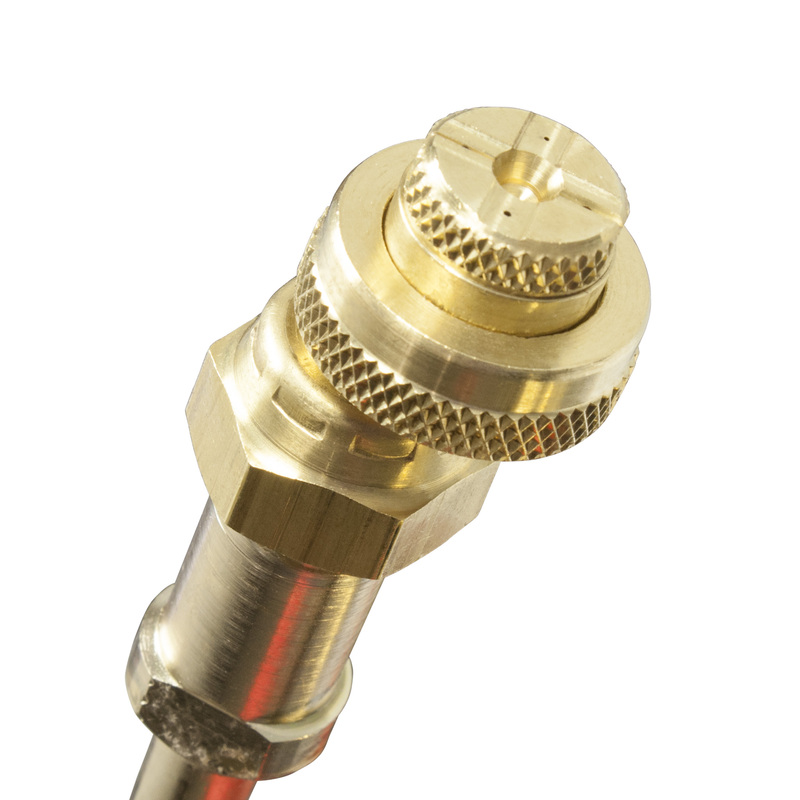 The B&G sprayer is the best sprayer available and it can handle a high amount of pressure. How do you safely clean the inside, wand, and hoses of the B&G sprayer? You should use the B&G Deluxe Sprayer Maintenance Kit to clean your B&G 1 Gallon Sprayer. It comes with solution, brushes, and full instructions from B&G to properly clean the sprayer. Because the sprayer consists of brass and stainless steel you should use special brushes when cleaning which the kit comes with. My B&G sprayer is leaking out of the tip. Everything is tight. What could be wrong? Usually, if your B&G sprayer is leaking out of the tip, then you need a tip gasket, part 4190. It is a small o-ring that goes around the end of the wand when you unscrew the 4 way tip or crack and crevice tip that you have on the wand. 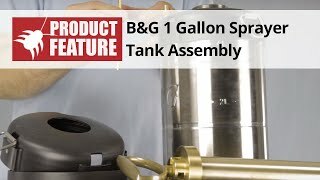 How tall is the B&G 1 gallon sprayer tank? The B&G 1 Gallon Sprayer tank is about 10 1/2 inches without the pump handle attached and about 14 1/2 inches with the pump handle attached.